Whether you need extra cooking space in addition to your stovetop, or you’re trying to cut the stove out altogether, a portable induction cooktop can provide the answer. Perfect for cooking all the same foods as a stove, you’ll be whipping up your favorites in no time, thanks to our top ten list of the best portable induction cooktops. We had our experts research and review more than twenty models to bring you the best on the market. Take a look at the specifications outlined below and keep them in mind while shopping, so you end up with the best choice to suit your needs. Power Levels: Check this spec to determine how many different power levels each model is capable of reaching. We count power levels in wattage, so keep this in mind. Temperature Range: You’ll need to be sure the model you’re eyeing is capable of cooking the meals you enjoy. Check here for the temp range of each product. Burners: Depending on the amount of food you’re looking to make on a regular basis, you’ll need to know how many burners are included on each design. We’ll tell you here. Material: If you have a preference about your cooktop material, check this spec. We’ll let you know if the model you like is ceramic, stainless steel, crystal, or another material. Size: Counter space and storage are probably important to you. They’re important to us, too, which is why we’ll break down the dimensions for each model here. Warranty: You’re looking for the best induction cooker, which means you’re likely to invest a bit. It’s nice to have your investment backed by a warranty. Check here for the number of years each model is covered. Now that you know what to look for, you’re ready to check out our portable induction cooktop buying guide! Each of the induction cookers we chose is a quality product with its own unique and beneficial features, so regardless of the model you choose, you’ll end up with a pleasing design. If you’re in a rush, take a look at our top and budget picks first. Let’s get started! Cook your heart out with our top pick for the best portable induction cooktop, the Secura 9100MC! 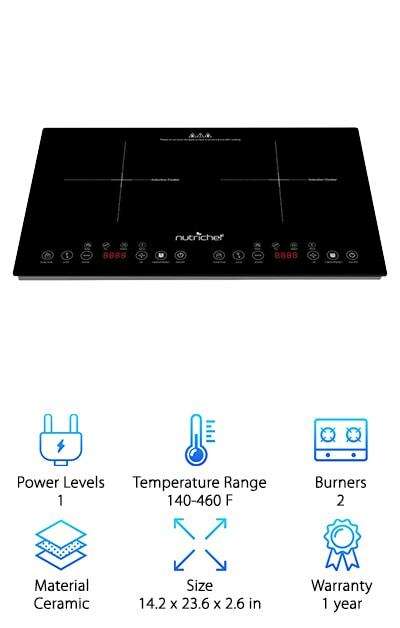 This model is equipped with fifteen power levels and a temperature range from 140 degrees Fahrenheit to 460 degrees Fahrenheit, giving you plenty of options when it comes to what you can make to eat. Front panel buttons and an LED digital control screen allow you to easily adjust the surface temperature and keep track of cooking time. The timer lets you set one minute increments up to 170 minutes, but don’t worry! It also features a low and high voltage warning system, so you don’t have to worry about the Secura overheating. It’s compatible with induction-ready cookware, including aluminum enameled iron and steel, stainless steel with a magnetic bottom, and cast iron. And it won’t take up too much room on your countertop, being a single burner. Sold with a one-year warranty and built to last, this deluxe model is perfect for making all of your favorites. Our budget pick comes from trusted and known kitchenware company, Cuisinart. 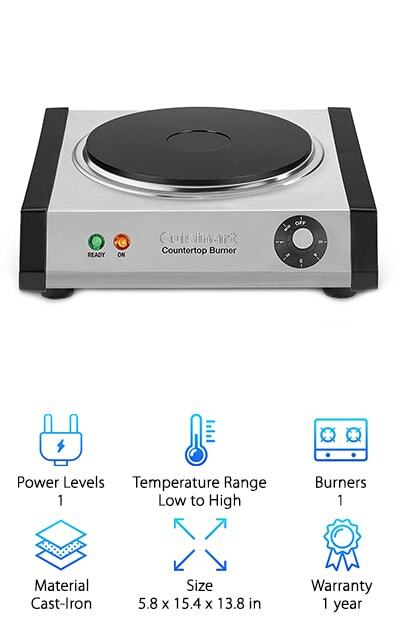 This stainless steel induction cooker features a cast-iron hotplate with a powerful 1300 watts behind it that allow it to heat up quickly and retain high temperatures during cooking. A front panel dial allows you to control the cooking temperature from low to highest heat, with six different settings. When the burner reaches the desired temperature, the convenient “ready” light will shine. And you’ll never forget your unit is on and hot, thanks to the “on” light on the front panel. A top product at an affordable price, according to portable induction cooktop reviews, the Cuisinart features an attractive design and looks nice on the kitchen counter. It’s small enough to store away easily when not in use. Even better, the coil-less surface makes for easy cleanup when you’re done cooking. No crevices to reach into, just wipe clean after the unit cools down! This design is perfect for anyone seeking a durable cooktop that won’t break the bank! The technology and convenience behind the Duxtop make it our next choice for the best single induction cooktop! A detailed front panel allows you to adjust the temperature, time, and power level, and features a convenient LED screen. Enjoy cooking temperatures between 140 and 460 degrees Fahrenheit and ten different power levels from 200 to 1800 watts. This versatile model lets you set the cooking time up to 170 minutes and includes a low and high voltage warning system, so you can rest easy knowing it won’t overheat. Additionally, the auto-pan detection setting will shut the unit off after one minute if no cookware is detected. But wait! 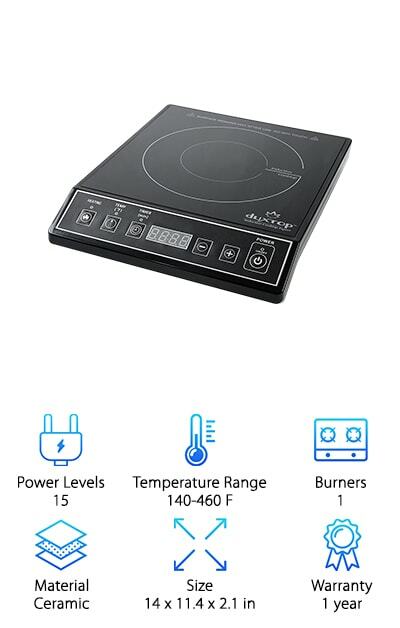 This super smart induction cooker also detects the size of the cookware and adjusts accordingly, so as not to waste any power! Talk about a model that has your back. Energy-saving, safe, and effective, you won’t want to miss out on this premium cooktop. During our search for the best portable induction cooktops, we came across a model with a ton of convenient features and rave reviews to boot. The Rosewill is a top-notch cooktop with a variety of convenient settings. Five pre-programmed cooking choices allow you to set the burner for specific temperatures, including hot pot, stir fry, fry, warm milk, or soup. 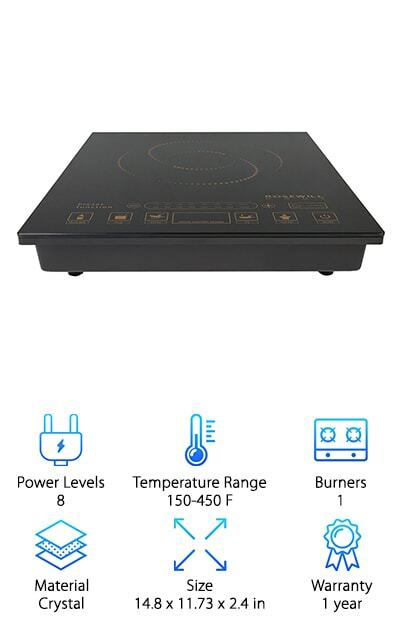 Manually control the temperature via a digital touch pad that lets you choose eight different temps from between 150 degrees Fahrenheit to 450 degrees Fahrenheit. Use the touch pad to set eight different power levels, from 300 to 1800 watts, as well. The polished crystal plate surface wipes clean easily and looks beautiful on your countertops, especially combined with the touch pad and LED display screen. And here’s the kicker: this model comes with its own stainless steel cooking pot to get you started on your collection of induction-compatible cookware! If you like to cook in style with convenience at your fingertips, look no further! Spend more time with family and less time cooking, thanks to the True Induction cooktop. Equipped with two power-sharing burners, this ceramic cooker uses less energy than a traditional stove and will cook your food in a fraction of the time! Boil a cup of water in just seventy seconds, thanks to the magnetic-based technology that utilizes compatible cookware to heat your food up quickly and efficiently. 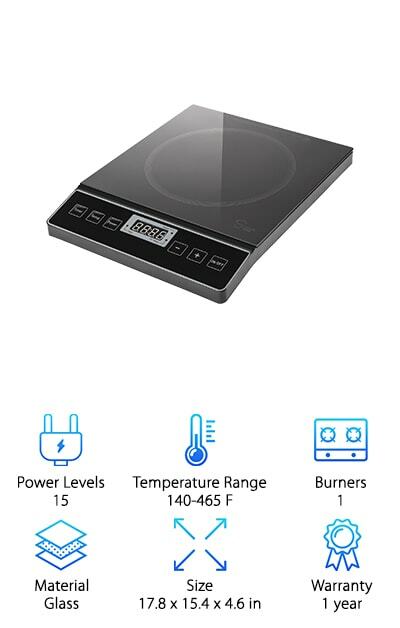 It is equipped with touch controls and safety features, including a turn-off feature that detects when cookware is not present, and a maximum temperature of 450 degrees Fahrenheit to prevent overheating. Easy to clean and store away when not in use, this cooktop rounds out our list as a deluxe model perfect for any family or gracious host looking for the ability to cook two dishes at once. Cook all your best recipes with temperatures from 150 to 450 degrees Fahrenheit in far less time than a traditional oven allows, so you can focus your attention elsewhere. Cook a delectable spread for yourself, family, or guests with the Chef’s Star cooktop. We searched for the best induction cooktop that’s portable and came across this deluxe product. You can host or bring it with you to help a friend who needs a hot meal! Featuring a glass cooktop and a digital control panel, the Chef’s Star looks great wherever you are and delivers precisely cooked meals. 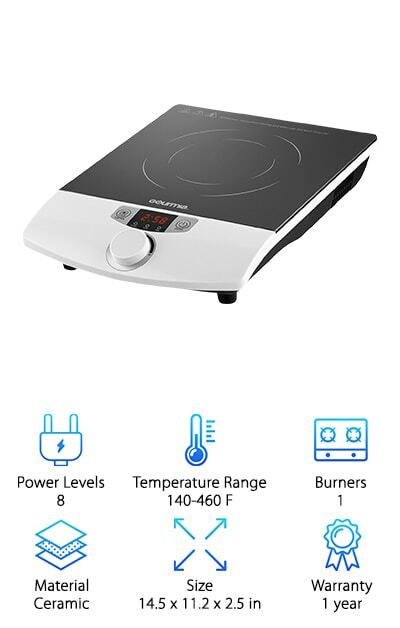 Choose from fifteen different power levels and fifteen temperature settings from between 140 to 465 degrees Fahrenheit. The vast temperature range allows you to simmer, boil, sear, or fry with ease! A built-in timer takes the guesswork out of cooking, by letting you set the cooking time in one minute increments up to two hours and 59 minutes! Even better, this model is equipped with safety features, including a pan detection system and diagnostic error message. Complete with a one-year warranty, the Chef’s Star is super affordable and worth every penny and then some. Enjoy 52 temperature settings from 100 degrees to 575 degrees Fahrenheit for perfectly cooked food every time! The Nuwave makes our list as one of the hottest cooktops we’ve seen, both in style and capability! A unique round design looks great on your countertop, while you enjoy the ability to cook nearly anything your heart desires, thanks to the high temps this model can reach. With six pre-programmed temperature settings and the ability to manually set the temp in ten degree increments, you’re sure to cook all of your favorite dishes to perfection. There are even separate delay and sear functions! And get this: Nuwave uses approximately seventy percent less energy than a traditional oven or stovetop, so it’s practical and efficient, too. With 1500 watts of power behind it, this premium cooktop lets you cook anything virtually anywhere you’d like. 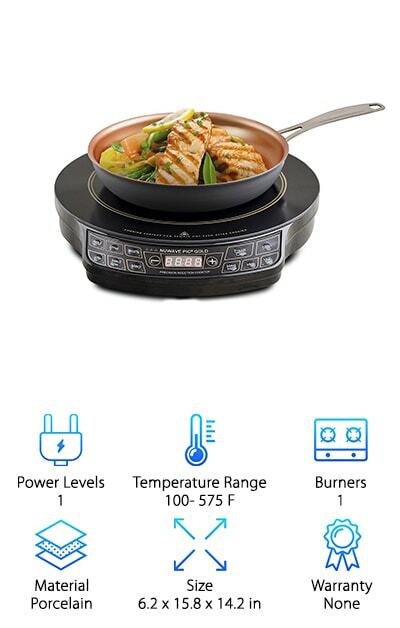 And here’s the kicker: this model is equipped with technology that allows you to program your favorite cooking procedures and a compatible non-stick fry pan is included in your purchase! 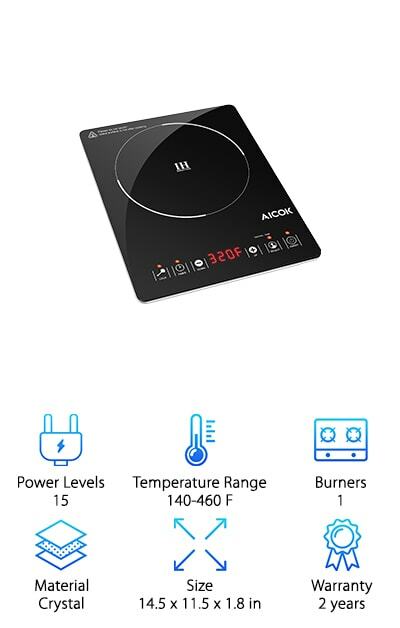 We had our experts spend time researching portable induction cooktop reviews, so you wouldn’t have to, and we’re here to tell you that Aicok is a favorite among consumers. This super-charged model boasts fifteen power levels that heat up quickly and retain high temperatures. In fact, you could eve boil two quarts of water in less than three minutes! Faster than the average stovetop, the Aicok is also more energy efficient, making it easier on your wallet than traditional cooking methods. 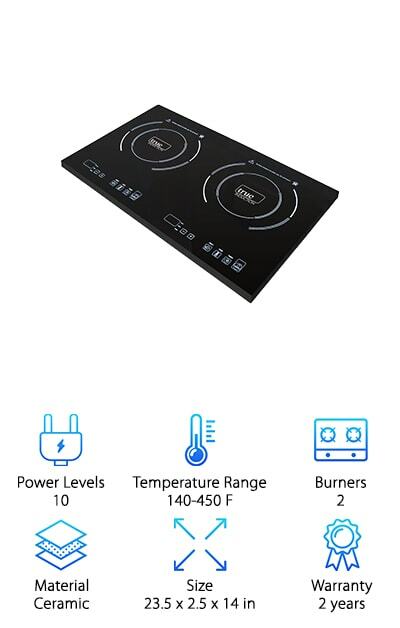 A touch control panel lets you set the temperature to fifteen presets between 140 and 160 degrees Fahrenheit, so you can cook your favorite meals. The super-thin design makes this product easy to take with you, too! It isn’t heavy, nor does it take up much space, so you can bring it with you wherever you go and whip up delicious eats for all your family and friends. The crystal surface looks elegant and makes for easy cleanup and safety features include child-lock settings, cookware detection, and beveled edges. Boil, fry, or steam with the NutriChef! Do two at once, thanks to its dual burners with independent temperature settings. This model lets you switch from one cooking mode to another at the touch of a button. An automatic warm function keeps food at the perfect temperature for eating, while you finish cooking. You can even set the built-in timer for up to four hours to cook a roast or let a sauce simmer. Providing quick and efficient heat, you’ll experience faster cook times than ever before. Boil water for tea faster than the microwave. Fry up bacon in minutes! Non-stick and non-staining, the cooktop is easy to clean and more energy efficient than a traditional stovetop and a built-in turbo fan provides a quick cooldown. Coupled with the easy cleanup, putting your induction cooker away when you’re done is a breeze and takes no time at all! If you’re looking for a cooktop that can make two dishes at a time, you found it. Do it all with the Gourmia GIC-100! You can boil, simmer, saute, steam, and sear! You can even deep-fry, slow-cook, barbecue, and grill, thanks to this versatile induction cooktop. With eight power levels and a wide temperature range (eight different temps) that allow you to enjoy precise cooking, your dinner options are endless. 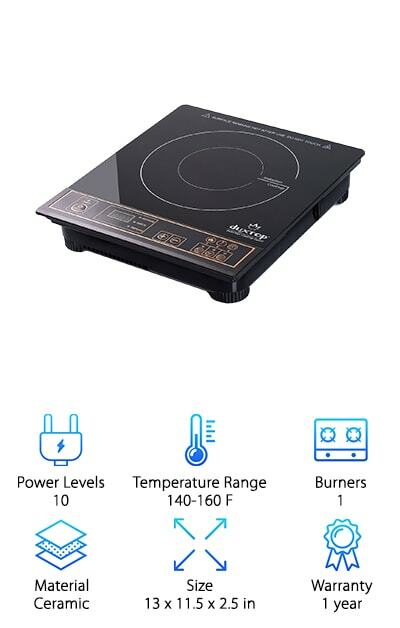 A convenient temperature knob dial and a digital display allow you to easily control cooking settings and a timer capable of reaching 180 minutes keeps track of the time for you. Equipped with an overheat sensor and in-line fuse, this energy-efficient model uses up to ninety percent less energy than a traditional stovetop! Compatible with induction-ready cookware, it will not turn on unless a pot or pan is already placed on the burner. When cooking is over, simply wipe clean. The ceramic, non-coil top makes it easy to clean up spills because they won’t stick to the cool surface or harden inside crevices. Practical and convenient, the Gourmia is perfect for making your favorite dishes.